Front row (l-r): Justice Ricky Polston, Chief Justice Charles T. Canady, Justice Jorge Labarga. Back row (l-r): Justice Robert J. Luck, Justice Alan Lawson, Justice Barbara Lagoa, Justice Carlos G. Muñiz. 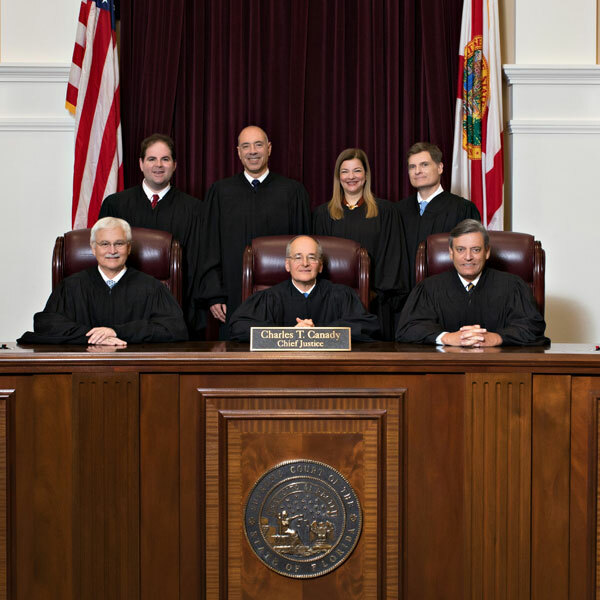 The highest court in Florida is the Supreme Court, which is composed of seven justices. At least five Justices must participate in every case and at least four must agree for a decision to be reached. The Court's official headquarters is the Supreme Court Building in Tallahassee. Read about Florida's Court System and the History of the Court for information about the role of the chief justice and the court's organization and jurisdiction. Justice Charles Canady is the 82nd Justice of the Supreme Court and has served in all three branches of state government and the U.S. Congress. He was appointed in 2008 and faces a merit retention vote in 2022. Justice Ricky Polston is the 83rd Justice on the Supreme Court and is well known for his work with foster care, including adopting a sibling set of six brothers into his existing family. He was appointed in 2008 and faces a merit retention vote in 2022. Justice Jorge Labarga is the 84th Justice on the Supreme Court and was born in Havana, Cuba, though his family fled to freedom in Florida when he was a child. He was appointed in 2009 and faces a merit retention vote in 2022. Justice Alan Lawson is the 86th Justice on the Supreme Court and previously served as chief judge of the Fifth District Court of Appeal in the Orlando and Daytona Beach areas. He was appointed in 2016 and faces a merit retention vote in 2024. Justice Barbara Lagoa is the 87th Justice on the Supreme Court and the first Cuban American woman to serve. She was appointed in 2019 and faces a merit retention vote in 2020. Justice Robert J. Luck is the 88th Justice on the Supreme Court. He was appointed in 2019 at an event held at Scheck Hillel Community School, where he attended classes as a child. He faces a merit retention vote in 2020. Justice Carlos G. Muñiz is the 89th Justice on the Supreme Court and now has worked in all three branches of state government as well as the U.S. Department of Education. He was appointed in 2019 and faces a merit retention vote in 2020. Florida's Supreme Court has a colorful past that goes back to the day when statehood was granted by Congress on March 3, 1845. Its members have included women and men who have represented both their times and the tremendous diversity of Florida. Here is a listing of former justices in reverse chronological order, with links to their biographies.